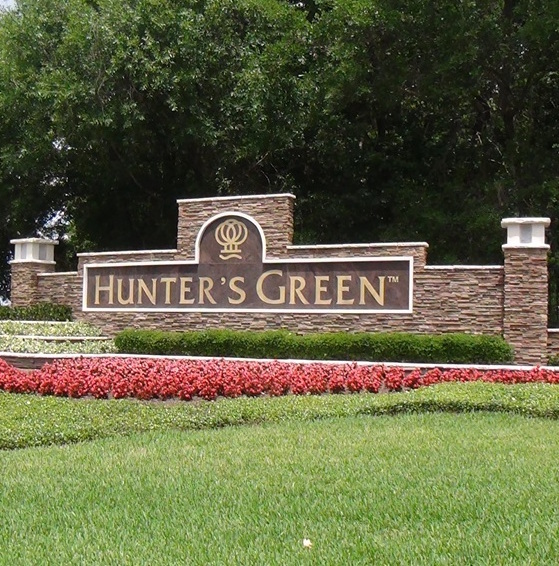 Hunter’s Green, located in thriving New Tampa, offers the a spectacular combination of suburban life and nature. Its 65 acres of protected wetlands, 42 lakes and 23 one-of-a-kind enclaves provides families numerous community facilities, including the 15-acre Hunter’s Green Community Park. The park has bike lanes, playgrounds, running trails and lighted tennis, basketball, sand volleyball courts, as well as soccer and baseball fields. You’ll also find a dog park where your furry friends can frolic without a leash, two playgrounds for kids ages 2 to 5 and 5-12, and a picnic pavilion with electricity and water. Hunter’s Green also offers membership privileges to Hunter Green residents at Hunter’s Green Country Club. The Club was designed as three clubs in one — an 18-Hole golf course designed by Tom Fazio, a Tennis and Athletic Center with a swimming pool, and a superb dining and social club. Golfers of all levels of skill can enjoy the challenged course — which was redesigned in 2006 — from several vantage points, ranging from nearly 7,000 yards to just over 5,000 yards. Hunter’s Green also has a premier tennis facility with 17 outdoor, lighted, Har-Tru class tennis courts, as well as a stadium court for tournament play. The club also offers a staff of certified tennis professionals who provide private or group tennis lessons and league tennis play. In addition, the outdoor swimming facility is located near a natural lake which provides a beautiful view from the terraced sun deck. The facility includes a junior Olympic pool that is heated and a detached children’s pool. There is also a community swim team. The swim center also offers convenient access to the Sports Center Grille. In addition, nearby Flatwoods Nature Park provides bikers, hikers and bird watchers a 7-mile loop to enjoy the great outdoors. Just beyond the gates of the community, you’ll also find plenty of stores and restaurants to enjoy. If you would like to discover all that Hunter’s Green has to offer, call us today at 813-431-2840. We are here to help you find a home that perfectly meets your needs. We’ve sold over 4800 homes in the Tampa Bay Area, and our experience, commitment, desire to exceed expectations, and best-in-class customer service guarantees your success!